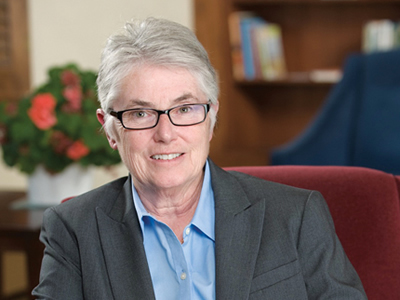 Syracuse University is taking another step toward the development of a lesbian, gay, bisexual and transgender (LGBT) studies major, with Professor Margaret Himley’s return to the full-time faculty. Himley, the University’s associate provost for international education and engagement for the past six years, is the newest director of LGBT Studies—an interdisciplinary program she co-founded in the College of Arts and Sciences (A&S) in 2006. Starting this fall, Himley will supervise the LGBT studies minor and teach queer studies courses. She also will spearhead a campuswide effort to create an LGBT studies major—an idea that caught fire in 2016, on the heels of a report by the Chancellor’s Workgroup on Diversity and Inclusion. A new academic degree program is not the only thing on Himley’s to-do list. She also plans to lay the groundwork for a new Center for Critical Sexuality Studies—a “gathering place for faculty and students to support research, teaching and activism”—and to review and revise the popular LGBT studies minor, in hopes of making it more interdisciplinary, intersectional and international. A proponent of progressive education, Himley combines a passion for innovative pedagogy with a scholarly interest in teaching and learning, as well as writing and rhetoric. She is equally bound to modern notions of social transformation. Teaching, research and activism, Himley opines, should coexist in and out of the classroom.